• Drug is made from human plasma and may contain infectious agents. Plasma donor screening, testing, and inactivation or removal methods reduce this risk. Promotes conversion of prothrombin to thrombin (necessary for hemostasis and blood clotting). Also replaces missing or deficient clotting factors, thereby controlling or preventing bleeding. Adults and children: Dosage is highly individualized, calculated as follows: AHF required (international units) equals weight (kg) multiplied by desired factor VIII increase (% of normal) multiplied by 0.5. To control bleeding, desired factor VIII level is 20% to 40% of normal for minor hemorrhage; 30% to 60% of normal for moderate hemorrhage; or 60% to 100% of normal for severe hemorrhage. To prevent spontaneous hemorrhage, desired factor VIII level is 5% of normal. • Before giving, verify that patient has no history of hypersensitivity to drug or to mouse, hamster, or bovine protein. • Follow prescriber's instructions regarding hepatitis B prophylaxis before starting therapy. • Refrigerate concentrate until ready to reconstitute drug; then warm to room temperature before mixing. • Roll bottle gently between hands until drug is well-mixed. • Give a single dose over 5 to 10 minutes at rate of 2 to 10 ml/minute, as appropriate. • After drug is reconstituted, don't refrigerate, shake, or store near heat. • Don't mix with other I.V. solutions. • Use plastic (not glass) syringe and filter. ☞ Monitor for signs and symptoms of anaphylaxis and hemolysis. ☞ Watch for bleeding tendency and hemorrhaging. • Check vital signs regularly. • Monitor CBC and coagulation studies. ☞ Assess for severe headache (may indicate intracranial hemorrhage). ☞ Tell patient to immediately report signs and symptoms of allergic response or bleeding tendency. • Caution patient not to use aspirin during therapy. • Instruct patient to contact prescriber if drug becomes less effective. • Tell patient to report signs or symptoms of hepatitis B. • Notify patient that he'll undergo regular blood testing during therapy. in the clotting of blood, also known as: antihemophilic factor A (Brinkhous), antihemophilic globulin (1) (Patek and Taylor), antihemophilic globulin A (Cramer), plasma thromboplastin factor (Ratnoff), plasma thromboplastin factor A (Aggeler), thromboplastic plasma component (Shinowara), thromboplastinogen (Quick), prothrombokinase (Feissly), platelet cofactor (Johnson), plasmokinin (Laki), thrombokatilysin (Leggenhager), and proserum prothrombin conversion accelerator. Factor VIII participates in the clotting of the blood by forming a complex with factor IXa, platelets, and calcium and by enzymatically catalyzing the activation of factor X. Deficiency of factor VIII is associated with classic hemophilia A. Factor VIIIC is the coagulant component of factor VIII which, in normal people, circulates in the plasma complexed with Factor VIIIR (von Willebrand factor), the plasma factor VIII-related protein, a large glycoprotein component that is synthesized by endothelial cells and megakaryocytes, and circulates in the plasma where it binds to arteries that have lost their endothelial cell linings, creating a surface to which platelets adhere. Disorders involving factor VIIIR comprise a heterogenous group of abnormalities called von Willebrand disease. A deficiency of factor VIII can lead to impaired blood coagulation. A protein substance in blood plasma that is an essential part of the blood-clotting process. Most cases of hemophilia are caused by a genetic defect that leads to a deficiency of this factor. Also called antihemophilic factor. a coagulation factor present in normal plasma but deficient from the blood of persons with hemophilia A. Acts as a cofactor to factor IX in intrinsic coagulation. Also called antihemophilic factor. (1) The attribute of von Willebrand factor (vWF) required for platelet agglutination by ristocetin; there is no specific equivalent term, as the use of specific terminology for functional activities of vWF is not recommended by the Nomenclature Committee. (2) Factor VIIIc—the functional attribute of factor VIII that is absent in factor-VIII deficiency (haemophilia A) and measured by standard coagulation techniques. (3) Factor VIII (in current use)—the protein that is defective or absent in factor-VIII deficiency (haemophilia A). 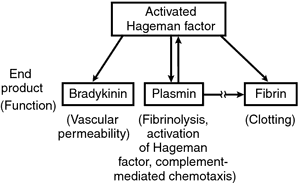 A plasma factor in blood coagulation; participates in the clotting of the blood by forming a complex with factor IXa, platelets, and calcium and enzymatically catalyzing the activation of factor X; deficiency is associated with classic hemophilia A. Factor VIII:C is the coagulant component of factor VIII, which circulates in the plasma complexed with factor VIIIR (von Willebrand factor), a glycoprotein that is synthesized by endothelial cells and megakaryocytes, and binds to arteries that have lost their endothelial cell linings, creating a surface to which platelets adhere. Disorders involving factor VIIIR form a heterogenous group of abnormalities called von Willebrand disease. Synonym(s): antihemophilic factor A, antihemophilic globulin A, proserum prothrombin conversion accelerator. A protein (globulin) necessary for the proper clotting of the blood. The absence of Factor VIII causes HAEMOPHILIA but it can be isolated from donated blood and given to haemophiliacs to control their bleeding tendency. The drug is on the WHO official list. A protein involved in blood clotting that requires vWF for stability and long-term survival in the bloodstream. In blood clotting, it participates in the clotting of the blood by forming a complex with factor IXa, platelets, and calcium and by enzymatically catalyzing the activation of factor X.
c) Factor VIII a la dosis de 25 U/ kg en dias alternos o dos o tres veces a la semana. A spokesman for Birmingham Health Authority insisted that the decision on whether to prescribe recombinant Factor VIII lay with doctors who were entitled to make a case to the health authority. Identification of factor VIII gene mutations in 101 patients with haemophilia A: mutation analysis by inversion screening and multiplex PCR and CSGE and molecular modelling of 10 novel missense substitutions. Acquired hemophilia: A natural history study of 16 patients with factor VIII inhibitors receiving little or no therapy. I survived car crashes, motorbike crashes and bicycle crashes in my youth without the use of Factor VIII. Franchini M: Postpartum acquired factor VIII inhibitors. Among the 273 coagulation factor deficiency patients, inherited coagulation factor deficiencies including factor VIII deficiency in 121 (44. Con el bolo de 1750 U (60 U x kg) de factor VIII e infusion continua de 400 U/h se inicio el procedimiento quirurgico, con gases arteriales y tromboelastograma dentro de los limites normales (Figura 1). 9 seconds with Factor VIII assay 34%, and later the PTT decreased to normal at 29. Severe Hemophilia A in a female by criptic translocation: Order and orientation of factor VIII within Xq28. licensed plasma-derived coagulation factor VIII products "is likely to be extremely small, although we do not know the risk with certainty. An FDA advisory panel agreed that a probable case of preclinical variant Creutzfeldt-Jakob disease (vCJD) attributed to a plasma product in the United Kingdom showed that the transmissibility of the disease via a plasma-derived factor VIII product is no longer theoretical.